There are 3 Assisted Living Facilities in the Springfield area, with 2 in Springfield and 1 nearby. The average cost of assisted living in Springfield is $2,722 per month. This is lower than the national median of $3,346. To help you with your search, browse the 10 reviews below for assisted living facilities in Springfield. On average, consumers rate assisted living in Springfield 4.9 out of 5 stars. Located in Middle Tennessee, the small historic city of Springfield is the county seat of Robertson County and lies about half an hour from Nashville. Two assisted living facilities in Springfield and another 10 in nearby communities provide multiple options for local seniors who need assistance with personal care, taking regular medication on a consistent schedule and daily activities of living. In Springfield, as in all of Tennessee, assisted living communities are licensed by the Tennessee Department of Health and are referred to as assisted-care living facilities. Springfield has a mild, temperate climate with cool winters and warm, humid summers, so area seniors can enjoy outdoor activities year-round. The cost of living in Springfield is 15.9 percent lower than the average cost of living in U.S. cities, making it a bargain for budget-conscious seniors. The Springfield area is home to world-class medical facilities, including NorthCrest Medical Center, in the event of medical emergencies or illness. Springfield has an array of community resources for seniors, including the Robertson County Senior Center, an organization that hosts exercise programs, social events and off-site trips for local seniors. The close proximity to Nashville, known as "Music City USA," offers plenty of arts and culture opportunities for seniors in Springfield. In downtown Springfield, seniors at local assisted-care living facilities may enjoy field trips to performances by the Robertson County Players, one of the oldest community theater groups in Tennessee, or visits to the town's quaint, walkable historic preservation district. Springfield doesn't have scheduled municipal bus service within city limits but is part of the Mid Cumberland Public Transit system, which offers reservation-based curb-to-curb transport within Robertson County as well as to and from neighboring counties. Senior fares are available, and the system prioritizes reservations for transport to and from medical appointments. The Nashville RTA also offers an express bus from Springfield and Joelton into downtown Nashville, and discounted fares for this trip are offered to seniors age 65 and older. Assisted Living costs in Springfield start around $2,722 per month on average, while the nationwide average cost of assisted living is $4,000 per month, according to the latest figures from Genworth’s Cost of Care Survey. 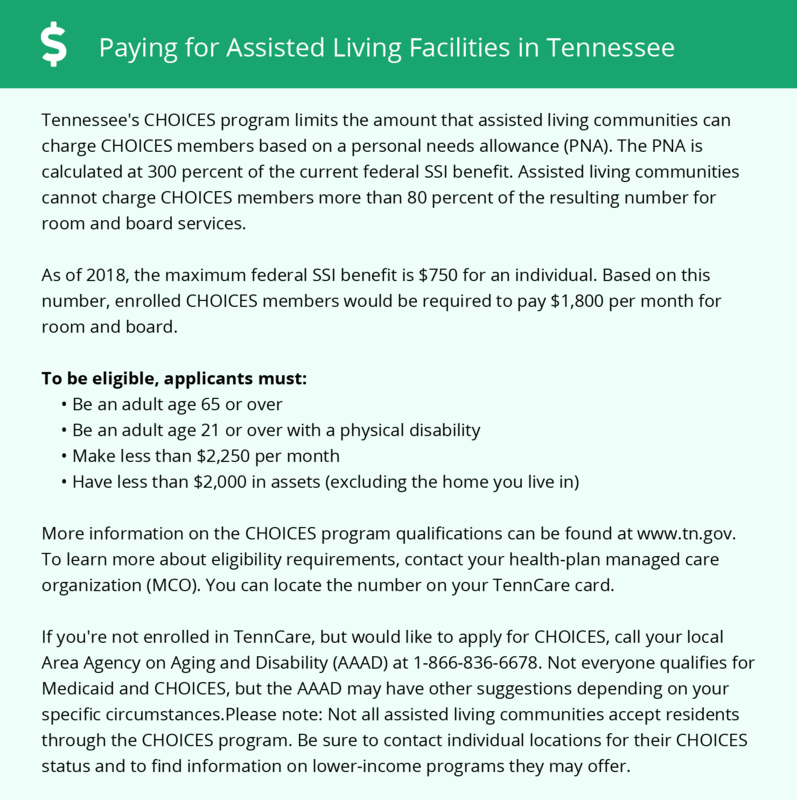 TennCare, the Tennessee Medicaid Program, includes a program called CHOICES, which can help cover the costs for eligible residents of assisted-care living facilities. Seniors have to meet specific income guidelines to qualify for the TennCare CHOICES program. To see a list of free assisted living resources in Springfield, please visit our Assisted Living in Tennessee page. Springfield-area assisted living communities must adhere to the comprehensive set of state laws and regulations that all assisted living communities in Tennessee are required to follow. Visit our Assisted Living in Tennessee page for more information about these laws.